In celebration of the 70th anniversary of the Universal Declaration of Human Rights, the United Nations Global Compact has released a new report — Human Rights: The Foundation of Sustainable Business — showcasing opportunities for businesses of all sizes and sectors to strengthen and scale up their efforts on human rights. Launched at the 2018 UN Forum on Business and Human Rights in Geneva, the report highlights how the UN Global Compact is working with its business participants and other partners to advance human rights, featuring a compilation of company examples, key resources and relevant activities at the global and local levels. The report celebrates the important progress that has been made by the business community on human rights, while at the same time recognizing there is still a long way to go before respect for human rights is truly universal. In highlighting the critical human rights challenges that we continue to face today, the report points to the 40 million people still in modern slavery around the world, as well as the widening economic gender gap. Building on the findings of the 2018 UN Global Compact Progress Report — where only 27 per cent of companies reported performing risk assessments directly linked to human rights, and only 17 per cent reported conducting impact assessments linked to human rights — the report challenges companies to move from commitment to action by deepening their efforts to respect and support human rights throughout their supply chains and operations. 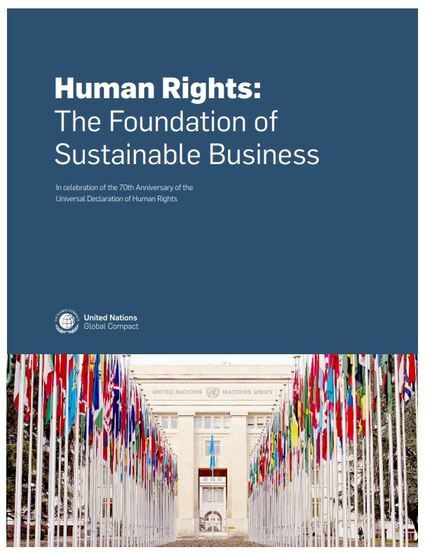 The Human Rights: The Foundation of Sustainable Business report celebrates the 70th Anniversary of the Universal Declaration of Human Rights (UDHR) and builds upon the UN Global Compact Progress Report. The report highlights insight and initiatives by Global Compact Local Networks around the world, presents snapshots of current practices from companies participating in the UN Global Compact and showcases initiatives that are advancing the UN Guiding Principles on Business and Human Rights. Hey Buddy!, I found this information for you: "UN Global Compact launches new report on human rights as the foundation of sustainable business". Here is the website link: https://www.duurzaam-ondernemen.nl/un-global-compact-launches-new-report-on-human-rights-as-the-foundation-of-sustainable-business/. Thank you.